For many years I carried an old Ka-Bar folding knife as my EDC. It holds an edge and works fine, but it was not really big enough for my hand and it has a serrated section. I am fine with serrated blades, but I would rather have all or none. This is just personal preference based upon the way I use a knife. Luckily, I was able to pick up a beautiful and functional EDC that seems to suit my needs a bit more. 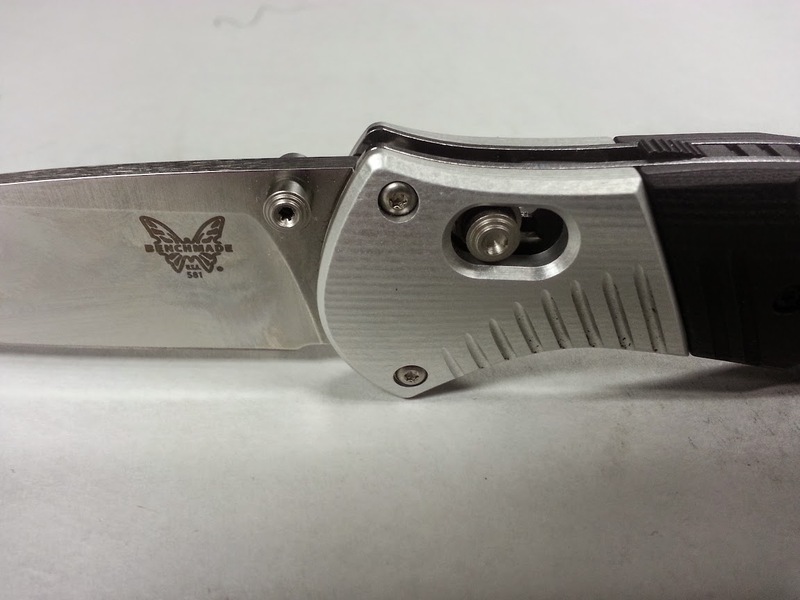 It is the Benchmade Barrage Model 581. Like it’s less tricked out brothers, the 581 also has the same locking mechanism. This thumb slide locks the blade so the spring assist doesn’t allow it to open in your pocket, but also locks the blade release so it won’t close either. It is a very nice feature to ensure you don’t stab yourself in the leg when carrying the knife while working. All you really need to remember is to push down on the slide a bit with your thumb and it will easily click into either locked or unlocked position. 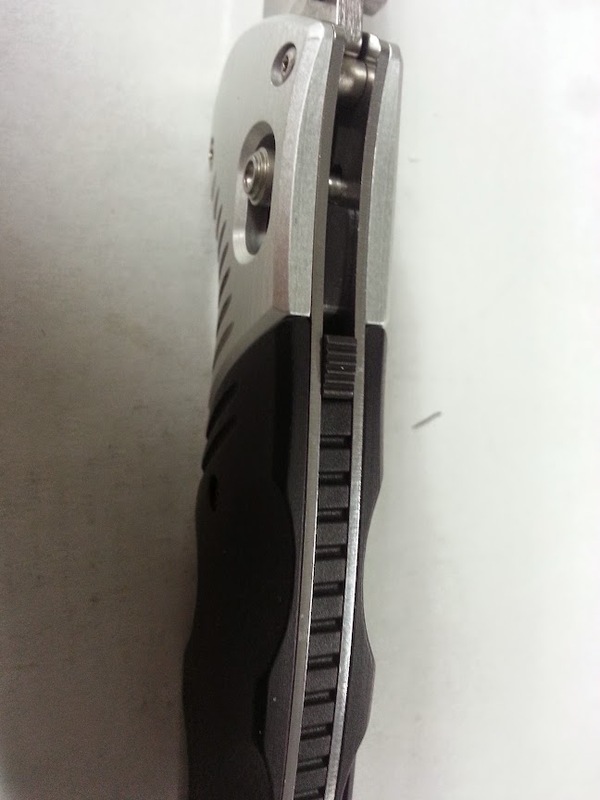 This is the blade locking mechanism. When the blade is out, just slide this guy back and it will release the blade. It is quite secure and takes one heck of a beating without failing. I have yet to have the blade release on me with either this model Barrage (Model 581) or the Model 580. The last big difference between this model and the others is the steel that is used. Instead of the 154CM that comes on the 580’s, this has a “super steel” called M390. It is supposed to be a super performance, high tech steel that actually starts off with iron powder for better mixtures and is used in surgical cutting instruments. The edge is hair popping and it does seem to hold an edge like no other EDC knife I have ever had. As to why I like this type knife, there are several reasons. 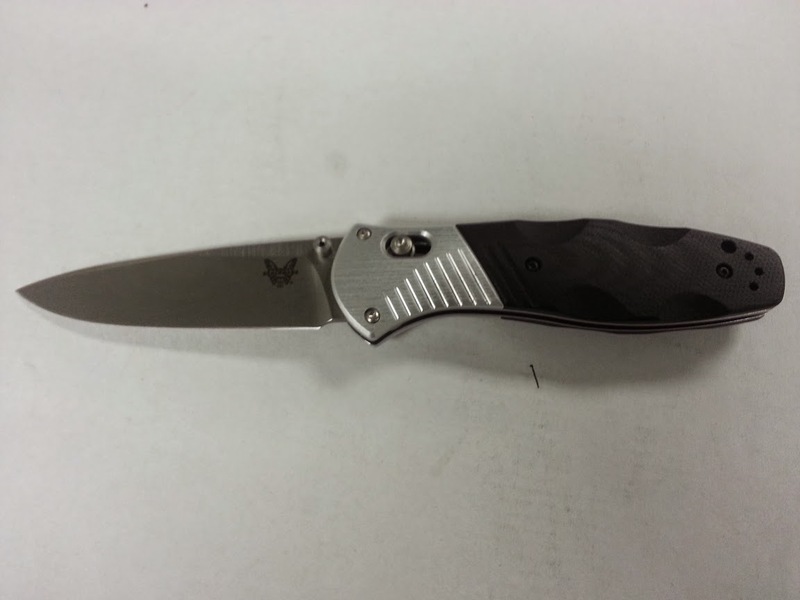 Many knifes come in with the drop point and have a good, solid handle like this that makes it easy to grip. Here are a few other features that I personally like. Drop point: For what I use an EDC knife for, this is just a perfect blade shape. It is easy to touch back up with a strop, I can do basic carving with it, and I can use most of the blade’s cutting surface for 90% of my jobs. Just my preference and usage needs. Convex grind: This has a convex grind with a secondary grind for the edge. I really like this grind versus a hollow ground knife, like most EDC options out there. Again, it is just my preference. Ambidextrous thumb studs: Because I use my knife with both hands, this is an important feature for me. My old EDC did not have them and I found that I had to do a lot of transferring the knife or opening it in odd manners with my left hand. This has made life much easier for me. Handle material: The 580 has a Valox handle that is ultra lightweight and just doesn’t give me the personal “feel” that I want out of a knife. This 581 uses G10 and and aluminum bolster which gives me the feel and weight that I prefer. The Valox holds and my hand doesn’t slip off it, but it just feels too light and throws the balance off in my hand. Many people (my son included) like the Valox, which is why the 580 is now his…. This knife retails for around $200. This is much more money than many people are will to pay for a pocket knife. I know that. Considering what a knife snob I am and how I like my “kits” that I build for each individual purpose, spending $200 for something that will actually span all those “kits” is something that I can justify. If you are looking for a good, all around EDC knife that will supplement all your heavy use fixed blades in your kits then the 581 might be the one for you. This entry was posted in Edged Tools and tagged Bechmade model 581, Benchmade, Benchmade Barrage, Benchmade EDC, Benchmade mod 581, Benchmade model 581, EDC folder, EDC knife, Model 581, pocket knife on January 5, 2015 by Woodsbum.